Modern studio entirely renovated in 2016 with a small balcony. Located in a former palace, quiet and surrounded by nature. 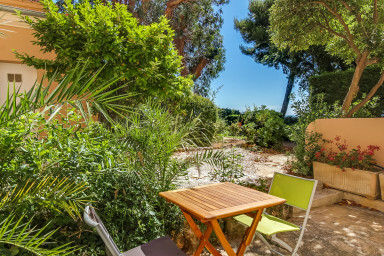 This 40m² studio, with an east exposure, at the ground floor, has free WiFi and air conditionning. Maximum capacity : 2 persons. In the living room, there is a comfortable sofa-bed for 2 persons. 1 toilet, 1 bathroom, 1 kitchen perfectly equipped (dishwasher, oven, microwave, expresso machine, etc...). Usefull informations: the bus stops close to the building and will drive you directly to the Center of Cannes. 1 parking place are at your disposal in the residency. La Californie – where you can find all the most beautiful villas of Cannes. Most of these villas have a swimming pool and a breathtaking Mediterranean garden. While being close to the city centre, you are also surrounded by a nature when spending time on that hill overlooking Cannes. During the day, there is a stunning sea views over the bay of Cannes. In the evening, the lights of the city are offering a spectacular show.